The Kawasaki Vulcan S is not your average cruiser. It stands out from the crowd with its Parallel Twin engine based on the superb Kawasaki ER6 and Versys 650. Its very modern and urban looks will ensure that it is always noticed wherever you decide to take it. A liquid-cooled, DOHC, 8-valve 649cc Parallel Twin with fuel injection is at the heart of this urban cruiser and delivers smooth, responsive performance especially in the low and medium rpm ranges. The engine was tuned for rider-friendly power characteristics that will inspire confidence in new riders as well as the more experienced. The Vulcan S offers smooth effortless starts from a standstill and smooth acceleration. Together with the compact engine and backbone-style rear frame, the frame's design creates a package that is slim, low, lightweight and compact. Low overall weight, 18" front and 17"rear tyres coupled with quality suspension result in a bike with light, easy handling and easy manoeuvrability which all adds to fun of riding it. 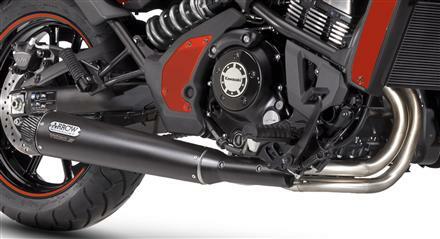 Compared to most other smaller-displacement cruisers, the Kawasaki Vulcan S has a significant weight advantage thanks to its compact engine and chassis design. Weighing in at just 228 kg wet, the bike's lightweight is apparent as soon as you lift it off of the side stand. A key feature of the new Kawasaki Vulcan S is the low seat height. Being able to easily put your feet on the ground when stopped is one of the most important factors in feeling comfortable and confidant on a motorcycle. At only 705 mm, the Vulcan S can be an option for everybody. 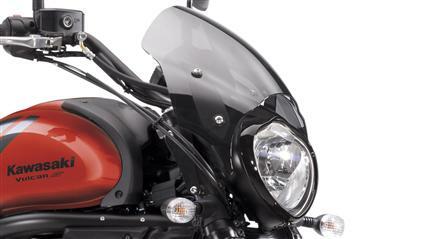 The Kawasaki Vulcan S Sport comes with a wind deflecting bikini screen and a full Arrow sports exhaust system. Whereas the Vulcan S Light Tourer comes with a large touring screen, a fixed backrest and a set of fixed leather panniers. Customisation is also readily available with variations such as removing the rear seat and replacing with a tubular luggage carrying rack being just one of the options due to be available from the range of Kawasaki accessories. Don’t just take our word for it, give us a call to arrange a road test. We are sure you’ll enjoy it. 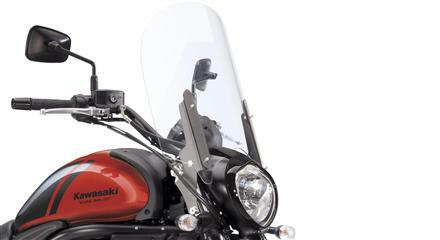 Why not take a look at our Accessorise My Kawasaki page where you can search for and buy genuine Kawasaki accessories for your Vulcan S.
Large windshield for improved comfort and wind protection. 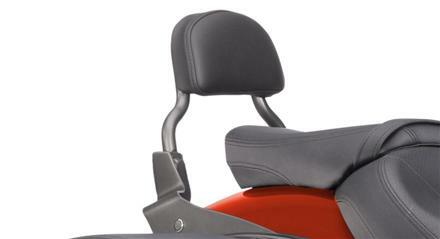 Padded backrest provides passenger comfort. Black steel construction rises 20cm (8”) tall from seat surface. 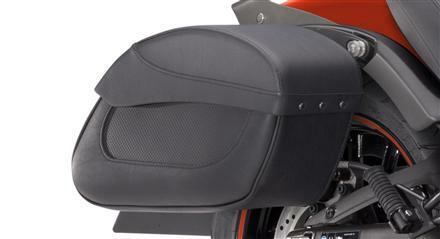 Keep your personal items secure on the road with saddlebags that complement the overall look of your bike. This black leather saddlebag set has reinforcements to keep the shape in all riding conditions. Being able to easily put your feet on the ground when stopped is one of the most important factors in feeling comfortable on a motorcycle. At 705 mm, the Vulcan S’s low seat is very accommodating. Original-design instrumentation cluster features an analogue-style tachometer and multi-purpose LCD. Convenient features keep riders fully informed of operating conditions.